I received my daughter's Bundles of Joy box in January, but was traveling for work, so wasn't able to write up my review for it until now. I wanted to get it written before Valentine's Day, because it definitely had a Winter/Valentine's Day theme. 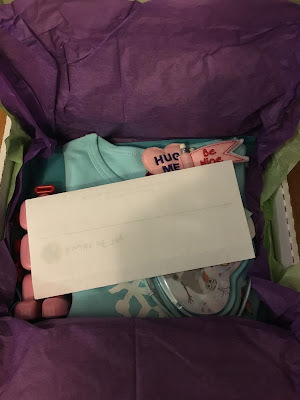 I love these boxes just as much as my daughter does! This was another great month!!! 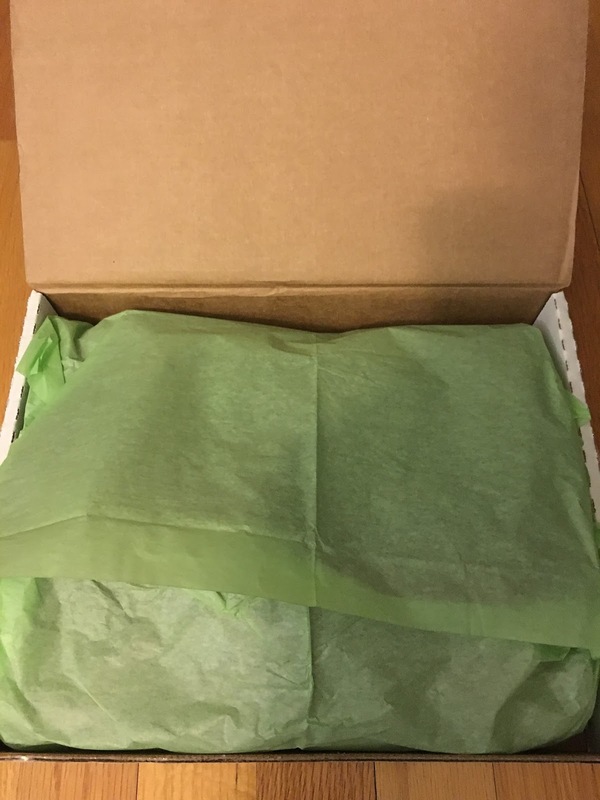 Here is a first peek at what was under the tissue paper. This month's box was a smaller size than usual, but it still contained just as much goodness! Bundles of Joy always includes an information card and a handwritten note with why everything was chosen. I love reading these. They are always so personalized! The first item my daughter grabbed out of the box was the Mini Love Bot in Pink! Retail price $4.99. 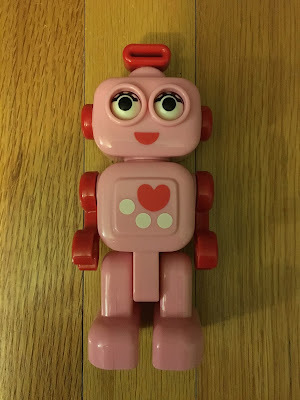 My daughter loved this and I love robots also, so I thought this was adorable. She grabbed it out of the box and started talking like a robot. So cute!!! 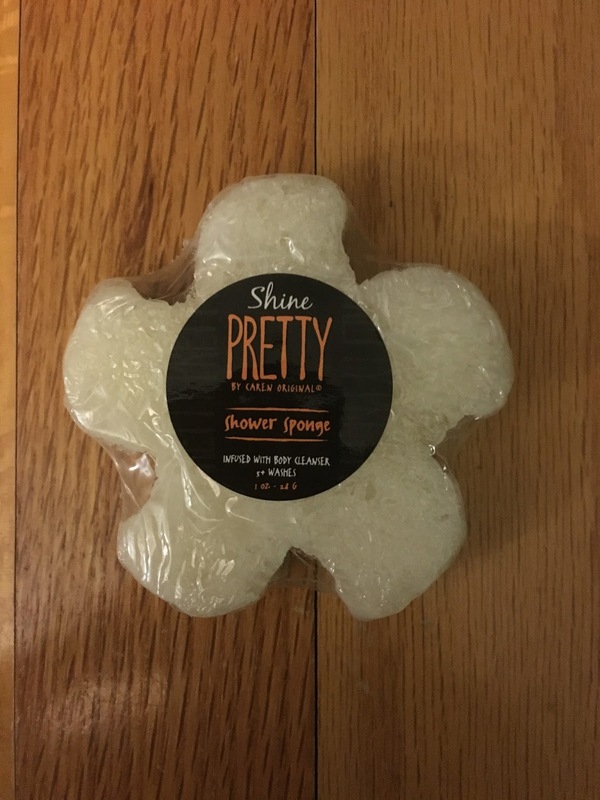 The next item included was Pretty by Caren Original Mini Shower Sponge. Retail price $6.50. This smells so good and my daughter loves bath stuff like this. We haven't tried this yet, but we will be soon. 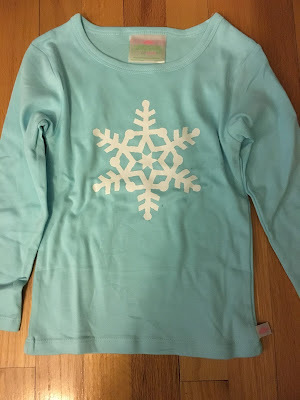 She also received Lolly Wolly Doodle Aqua White Snowflake Top. Retail price $23.00. This is cute! It's soft and comfy, just my daughter's style. She'll definitely be wearing this through the rest of the winter months! The next item included was a Janie and Jack Aqua and White Headband. Retail price $16.00. 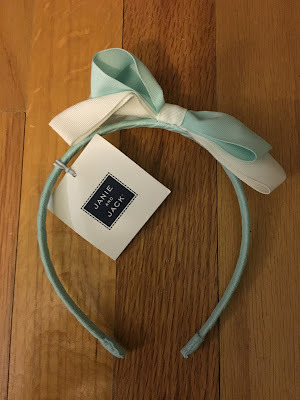 I love Janie and Jack and my daughter loves headbands, so we both liked this! It's very cute and goes with the shirt included this month and many other clothes my daughter has!!! 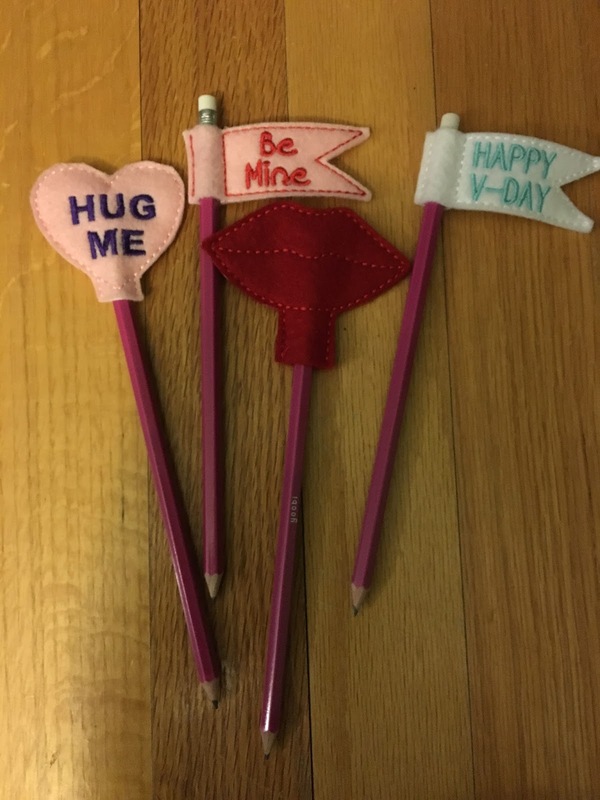 The final item included was Rosie K Embroidery Valentine's Pencil Toppers and Pencils. Retail price $4.00. These are so adorable! I think I just love anything felt or holiday themed. My daughter thought these were fun too. And she loves to draw, so these are great!!! Oh, there was another thing included, that wasn't on the information card. 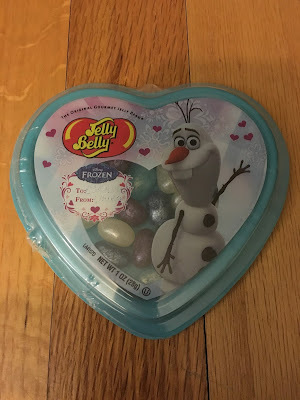 Frozen Valentine Candygram Jelly Belly Jelly Beans. My daughter loves these and loves Frozen! These didn't last long, but I did get a pic! This was another great month with Bundles of Joy! 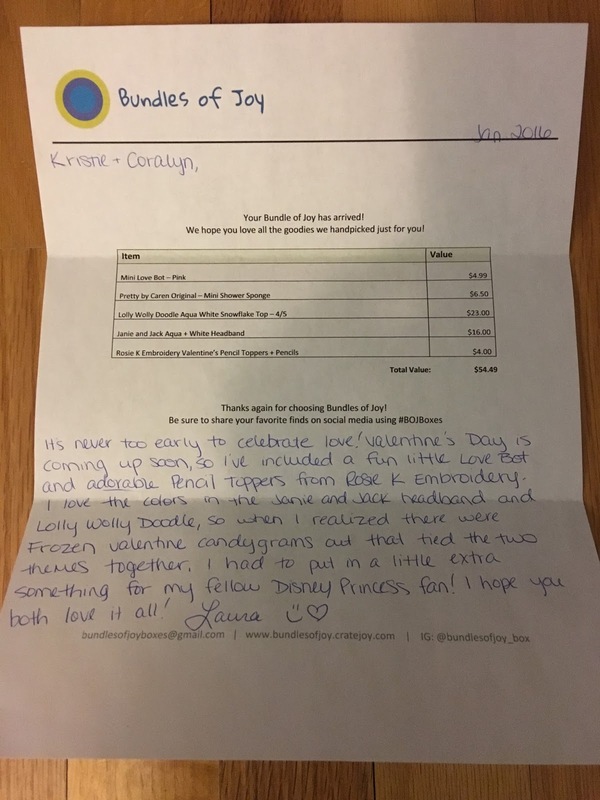 I really love everything she includes in the boxes and we never get items we already own, which is great!!! I can't wait to see what my daughter gets for February!